We love beer. We also love the Murray is the mantra for the Wilkadene Woolshed Brewery. One of the many experiences behind the name is the picturesque Amazon Creek, found just upstream from the iconic and historic Wilkadene Homestead, the home of Woolshed Brewery and Above Renmark Houseboats. To commemorate this majestic part of the world, Tom and Sarah present their inaugural brew, Amazon Ale. Hand crafted boutique premium beer, made using solar energy, rainwater and 100% recyclable techniques. Amazon Ale is a full bodied, full flavoured Golden Ale which is extremely drinkable. 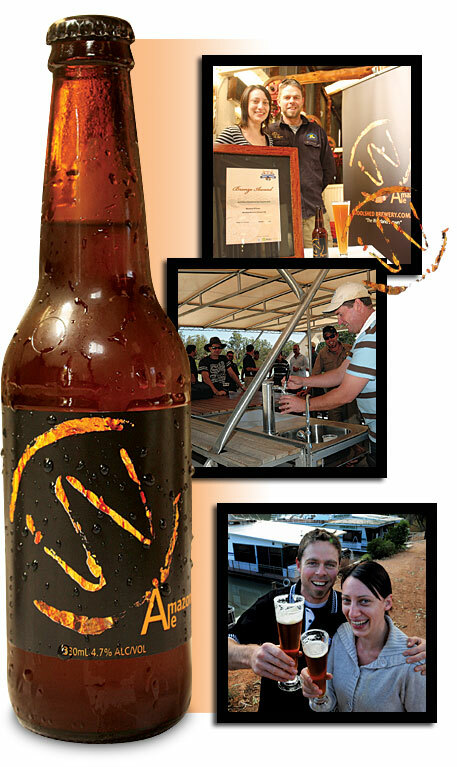 Launched in 2009, the Woolshed Brewery is a new Riverland proud micro-brewery producing their unique amber batch of Amazon Ale. Located on the banks of the Murray River, WIlkadene was a famous sheep and wheat station, built and run by the Wilkinson family until being bought by the Freeman family in 1988. The WIlkadene shearing shed which is now the brewery, with its white ant resistant native pine posts, supplied paddle steamers with wool and chaff, by way of a chute from the shed down the cliff to the river. After purchasing a microbrewery in July 2008, Tom and Sarah have been busy cleaning up the old Woolshed and installing the Brewery. Along with extensive upgrades needed to the power supply and building internals, they have added nearly 100,000 litres of rain water storage, rather than relying on filtered mains water, thus saving precious water from the Murray. The brewery is also a zero waste brewery, utilising state of the art designs to use and re-use hot and cold water without the need for excessive heating. Also, with drainage troughs and a holding/settling tank, all waste water from the brewery is used on our extensive garden. All spent grain is used for livestock feed. Keeping the rich heritage of the Wilkadene property was paramount to creating a distinct and unique style for the Woolshed Brewery. 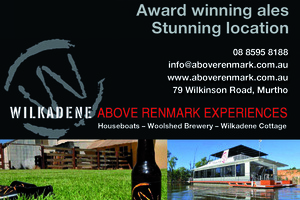 The micro-brewery has a distinct Riverland flavour, right down to the name. So why not stay at Wilkadene or hire Australia's only houseboats that brew their only local style of premium beers and cruise along the river with a coldie on tap.